Barnsley striker Jason Scotland scored a late winner as Middlesbrough's dismal start to 2013 continued. The visitors had taken an early lead through Jim O'Brien, before Boro responded in the second half through Mustapha Carayol and Curtis Main. Barnsley were not to be denied, however, and Scott Golbourne equalised before Scotland sealed the points with his third goal in as many games. Tony Mowbray's side have now lost all five of their league outings in 2013. The Middlesbrough manager had called for his team to go back to basics after the 4-0 trouncing at Ipswich - but his side looked bereft of ideas for long spells in front of a disgruntled crowd at the Riverside Stadium and Barnsley were good value for a sixth win in seven games. It was a result that sees Barnsley edge further away from the relegation zone having caught Middlesbrough cold with an early goal. O'Brien gathered the ball in the right channel and his speculative effort from the edge of the box took a wicked deflection off George Friend and loop over Middlesbrough goalkeeper Jason Steele. The hosts had to wait until five minutes into the second half to draw level. Emmanuel Ledesma's through-ball allowed Gambian Carayol to pounce after an effort was parried. Middlesbrough added a second 12 minutes later as substitute Main bundled home Seb Hines' cross at the back post. But Barnsley came storming back, levelling through Golbourne before snatching the lead when Jason Steele handled a back-pass just outside the right-hand corner of his six-yard box. Golbourne laid the indirect free-kick off for substitute Scotland, who rifled his effort in off the underside of the bar to claim victory. Barnsley manager David Flitcroft: 'We've achieved nothing. It's got to be 46 games and this group of players will not get carried away. "I don't do people who come to work to be average - I do people who come to work to achieve, whoever that person is. "I'm telling this group to become heroes and achieve something that at one stage looked impossible and gets talked about for years to come. "(Former Barnsley boss) Keith Hill's assembled an incredible squad - his recruitment is amongst the best in the country. Fortunately now we're getting the best out of them." 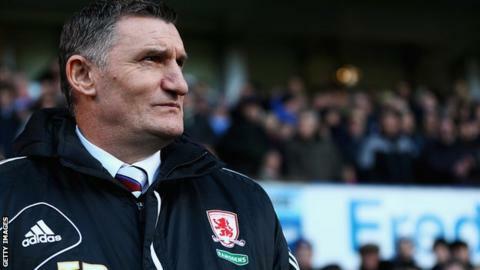 Middlesbrough manager Tony Mowbray: "Managers at the bottom end of the table normally come in and complain about things going against them - deflected goals and a bit of bad luck - I feel a bit like that at the moment. "It was a kick in the teeth after five minutes with the huge deflected goal. "I can't question their commitment to win the game; I can feel their frustration in the dressing room at the end. We've given everything we can to try and change it around. "How do you get out of it? You stick together, you work hard, and you try to do the right things every day. You have to keep going."